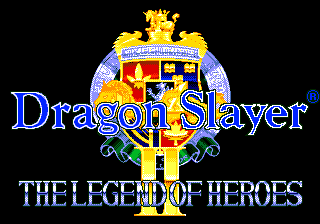 Dragon Slayer: Eiyuu Densetsu II (ドラゴンスレイヤー英雄伝説II) is the sequel to Dragon Slayer: Eiyuu Densetsu within the eponymous subseries (whether or not it is also part of the main Dragon Slayer series is unknown) released by Falcom in 1992 for the PC-88. As with Eiyuu Densetsu, it was ported to a number of systems, including to the Sega Mega Drive in 1995 by Sega Falcom exclusively in Japan. The Dragon Slayer series would continue with Lord Monarch, which also saw an entry on the Mega Drive. However, with the next The Legend of Heroes game, Eiyuu Densetsu III: Shiroki Majou, Falcom decided to break the series away from Dragon Slayer. This third game was ported to the Sega Saturn in 1998. Main article: Dragon Slayer: Eiyuu Densetsu II/Magazine articles. NEC Retro has more information related to Dragon Slayer: Eiyuu Densetsu II.